With 75% of jobs reportedly with 1/2 mile from a freeway, why isn’t Santa Clara County at least investigating the use of these stoplight-free corridors as routes for Bus Rapid Transit and other shared vehicles? This post will look at the idea of how Silicon Valley could take San Diego’s idea improve it through the creation of a Bus Rapid Transit network and associated mixed-use transit centers in Santa Clara County’s freeway and expressway corridors. With funding spearheaded by a 2004 voter-approved, local 1/2 cent, 40 year sales tax, the I-15 express lane corridor is a 20-mile, 4-lane, freeway-within-a middle-of-a-freeway, that is open to multiple modes of transport, including bus and cars. Carpools and certain clean-air vehicles are free, while single occupancy vehicles pay for access. A movable median barrier allows the number of lanes to be expanded to three in one direction during peak time. Another key element to moving more people is the inclusion of a 2.2. mile long, 12-foot wide, two-way bike lane on a portion of I-15. This $14 million, well lighted route is physically separate from the freeway traffic and provides riders with a safer biking alternative than traversing street traffic. This $14 million project has an expected completion date towards the end of 2017. An idea for capping 280 with mixed Use. Santa Clara County should look at a similar network of Bus Feeder routes using existing freeway and expressway rights-of-way. Elements of this approach were touched upon in an earlier article, A Transition Step(s) to an Autonomous Transport Future. With the advantage of starting later, as compared to San Diego, Silicon Valley has the opportunity to bring several innovations that will create an even more efficient way of transporting people. The fundamental difference with San Diego’s effort is the creation of mixed-use transit centers that would include, as possible, high-density affordable and market-rate housing, commercial and retail spaces. Like San Diego, park and ride would be included, as well as easy transfer to last-mile solutions, like shuttles, bike-share and ride-share. Of course, by building housing at freeway interchanges, it could actually reduce vehicle miles traveled as more people would be at locations that are within 1/2 mile of their jobs. A key part of the financing for this sort of effort would have to come from public-private partnerships, similar to what Hong Kong’s transit authority has done to develop high density near transit stations. Providing incentives to developers to build on these platforms (e.g., express permitting for pre-approved construction techniques, reduced/no parking requirements, etc.) would be necessary to expedite build-outs. These wouldn’t be subsidies as much as creating a cookie-cutter process. 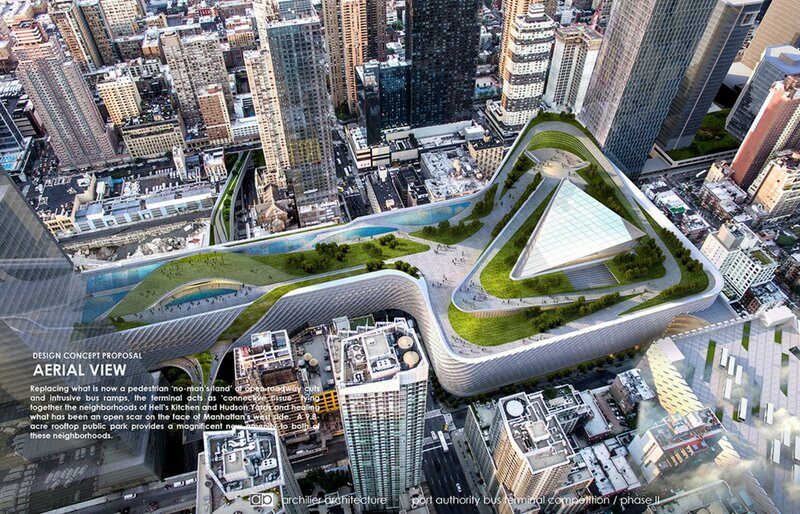 Proposed new Port Authority Bus Terminal by Archilier Architecture Consortium. Added 9/22/16 – The Port Authority of New York and New Jersey provides another example of a public agency using its air-rights and rights-of-way to encourage development. Relevant to this article, they just released the results of a design competition for a new bus terminal that is estimated to cost between $3.7 to $15.3 billion. All the proposals envision mixed-use and some combination of open space (one featuring a 9.8 acre park) to help offset costs. A video showing the idea of capping freeways. It’s being done worldwide. By building relatively high-density clusters, the need to build high-density into suburban neighborhoods wouldn’t be as necessary; creating a buffer between traditional single family homes and multi-story housing. At the same time, the suburban neighborhoods would have additional transit options, thanks to the relative close proximity of high-speed express lanes and transit centers on existing exchanges. As an exercise, one stretch of I-280, from Highway 85 to I-680 was examined to look at the possibility of creating platforms over the existing freeway. This isn’t necessarily the most job-rich area of Santa Clara County, but given that the VTA is studying this corridor, it seemed appropriate. Click on image to see possible transit station locations. Ten major intersections were identified as possible urban center/transit areas, which translates to about a station on average every 1.2 miles over this 12 mile route. Some other important statistics. The route stops at I-85, although it is expected that express buses might continue through the largely residential, rural and wealthy hills to the job-rich area in the Page Mill/Caltrain area of Palo Alto. The roof top garden on top of the Panoramic Building in San Franciso. 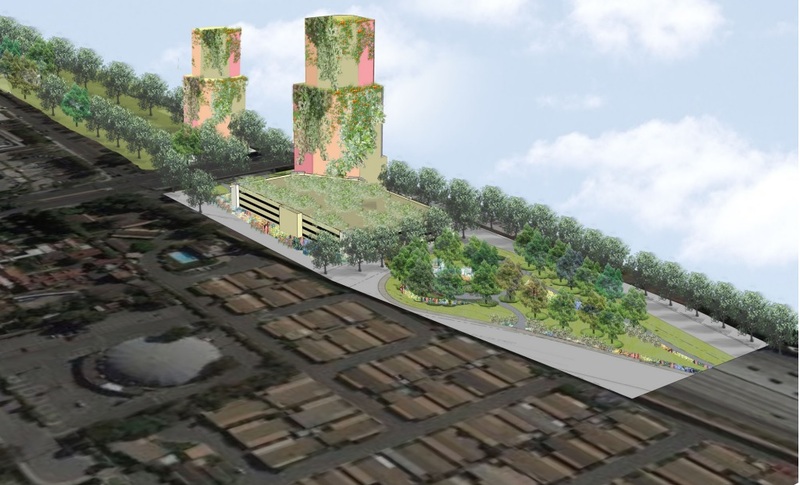 Collectively, about 123 acres of land would be recovered via platforms. At $1-$5 M/acre, this is an asset worth north of $120 to $600M. Assuming car-free, modular micro-housing, as described in this video, with a density of 640 units per acre (160 units in 12 story buildings on 9,000 square feet), with approximately 1/4 open space, then this corridor could house approximately 19,000 units (realistically, this number would be much less, as commercial/retail/park & ride would be included in these developments). It is assumed that higher portions of the respective platforms would be towards commercial properties, while buildings would be lower towards existing residential areas. It is assumed that bike lanes would be part of the project, allowing protected, active routes between the urban/transit centers. These bike routes potentially could have ingress/egress to residential neighborhoods as well. The VTA, as a congestion agency, would treat this as a high-speed corridor for transporting people. As such, it would need to encourage private transit systems over these corridors (provided they pay for its use). This would give consumers additional choice (e.g. a private operator might find a demand for an express route from say downtown San Jose to Apple in Cupertino and could ramp up and ramp down service faster than a public agency). Chariot, which was recently purchased by Ford, is an example of a privately-held entity that could help provide both regional and last-mile connectivity. Incentives should be provided for electrification and/or carbon-free emissions (e.g. the aforementioned private operator might pay less, if they use electric buses). With the recent passage of SB32, these sort of things will be necessary to secure state funding. Consider a requirement to use of Vehicle to Vehicle and Vehicle to Infrastructure technology to use the express lanes. This offers the potential for platooning, such as being proposed by Pelaton, which could provide a further 5 to 10% reduction in fuel requirements. It also allows for greater throughput at a given speed compared to regular driving. Develop and encourage low-cost, low-polluting, last-mile solutions – whether this ,means better pedestrian access, shared bikes and low-speed autonomous shuttles (e.g. such as ones that are tested in places like Singapore and Perth). 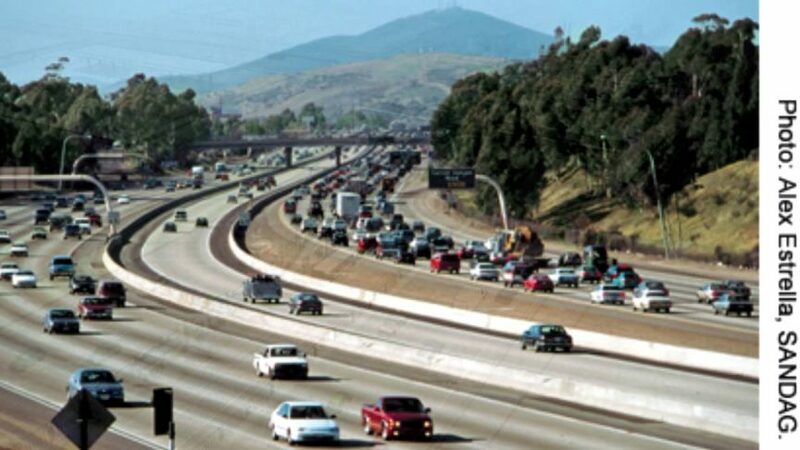 Given a scope that is similar to what San Diego built with its 20-mile stretch, it isn’t unreasonable to think that a 12-mile stretch could be built for approximately $1.4 B. It is assumed that the extra costs associated with building developments above the larger platforms envisioned in this approach, would be borne by private developers building commercial, retail and residential spaces. The question of how air-rights would be distributed and valued is one for further exploration. For instance, perhaps it would be a model similar to the Homestead Act, whereby an entity would be given a certain time to develop after being given air rights. That development might include the requirement to build a platform that could be used for the transit center. Or, the air rights might be auctioned off in some manner. From an operational standpoint, a simple analysis suggests an investment of approximately $50 M for enough $1.5 M electric buses to provide a commute time of approximately 30 minutes over the 12 mile stretch of 280 between 101 and 85 at peak-hour. This is with a frequency of less than 1 minute. Of course, what this implies is that the buses might actually form mini-platoons depending upon peak-hour conditions (e.g. multiple 42 passenger buses would form virtual trains to fulfill capacity needs). Similarly, with platooning technology, it could be possible to eliminate drivers from some of the buses, creating virtual trains during peak hours. At 1/3 the projected cost of a 4.2 mile extension of BART and with much less disruption to existing businesses and residences, VTA should examine an approach that enables high-speed vehicle transit on the existing freeway and expressways corridors. This holistic path would represent a significant investment and would take decades to implement, but it would build on the existing rights-of-way and traffic-use/land-use patterns as well as provide a path to incorporate evolving technology, such as autonomy. Ultimately, this should prove to be lower risk and lower-cost than as compared to alternatives that require new, expensive rights-of-way. An update of what a couple VC folks in Seattle are proposing for a 150 mile autonomous freeway within a freeway on I-5 between Seattle and Vancouver. We need to get VC folks involved in our area. and here is the Google Drive with their renderings, etc.